I was invited by Amazon Web Services to give a talk at the NYC Loft to discuss some of the trends happening in Internet of Things over the last year and run a workshop focusing on Intel Edison over the course of two days. Thanks to the excellent folks from Dash and Canary we had a great lineup of talks last Thursday, probably around 80-100 developers were in attendance and another 40 for the workshop the following day. Really enjoyed making the trip and seeing the new AWS space, looking forward to exploring many more potential areas of collaboration between Intel and AWS IoT ecosystems and partners. What Happens To Old Systems-On-A-Chip When No One Wants Them? Mobile phones are neat aren’t they? Tiny, thin, capable of driving touch-screens and your favorite app stores as fancy mobile operating systems. Today’s phones come packed with capabilities such as Wi-Fi, Bluetooth, GPS, GPRS, light-sensors, gyroscopes, audio, GPUs and accelerometers. As a result of years of fierce competition, the average person now carries a super-computer in their pocket which also doubles as a cloud-connected sensor-hub. SoCs have been produced by the train-load for the last several years…which raises a question: What happens to old SoCs after they get “put out to pasture.” What happens to older versions of these components six months later when “the next-next best thing” comes out? According to market forces, their prices drop..
Quick Poll: Raise your hand if you want an Android phone built on processing components from two years ago. Anyone? Anyone? Didn’t think so. Now raise your hand if you want a single-board computer, quad-core with a GPU capable of Bluetooth and Wi-Fi for $9? I saw a couple more hands go up for that one. These left-over SoCs live new lives, they get stuffed into single-board computers and repurposed on the hobby market, perhaps added to drones or robots. Maybe they form the core of new low-cost educational computers to teach kids in India to learn how to code. Who knows! Now close your eyes and imagine a growing stockpile of hundreds of millions of these components: The guts of this year’s stellar Android phones that don’t get sold gathering dust in boxes someplace in China with nowhere else to go but into the next Kickstarter. How about a $3 quad-core GPU, Wi-Fi and Bluetooth computer? Last week I executed on the second (and final, as an evangelist) Industrial Internet of Things Workshop focusing on Wind River Linux, Helix Device Cloud, Intel Edison (IoTDevKit) and our Moon Island Gateways. 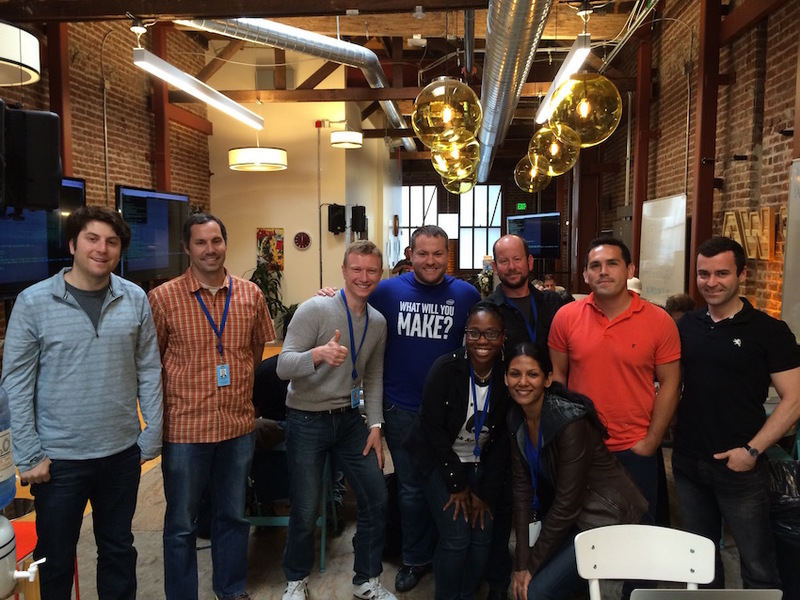 40 IIOT developers selected from a list of locals were in attendance. Our projection surface was a bed sheet but hey, sometimes you just have to roll with things. Spent the last two days hauling tons of laptops and gateways in a U-Haul truck, that was fun. 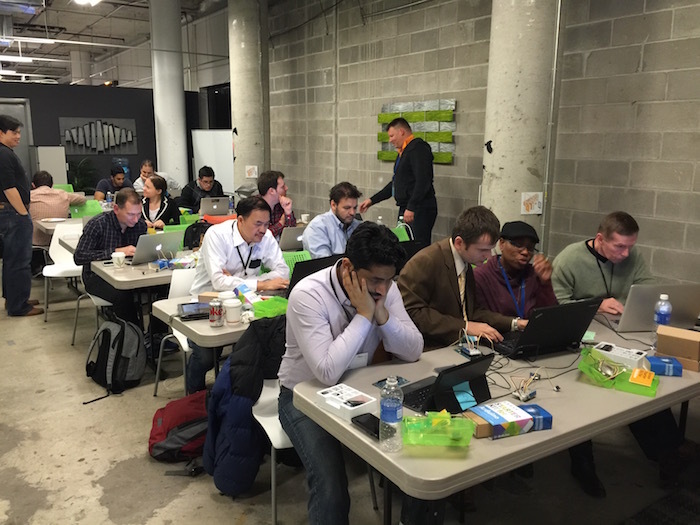 40 developers, 40 Moon Island Gateways, 40 Intel Edison and Sensor Kits and an IBM Bluemix workshop, fun times. Check out our new Intel IoTDevKit samples for AWS IoT. 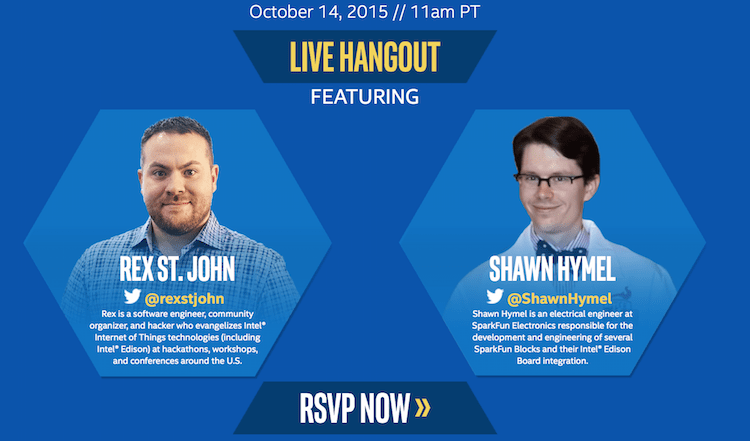 Our chat with Shawn from SparkFun is now live on YouTube. Many topics were covered including potatoes. So this is happening tomorrow, RSVP today. My team spent the last three months collaborating with Amazon Web Services on a new custom Intel IoT sensor kit from Seeed Studios. The new kit contains a variety of industrial sensors useful for prototyping new IoT solutions. We are very excited to see how the internet of things space is continuing to evolve. We have published getting started guides and some sample applications to help developers get up and running with the new AWS for IoT platform. Thanks to Amazon Web Services for inviting me to support two 8-hour IoT Bootcamps prior to re:Invent, looking forward to many more such workshops. I have been working with the folks at Amazon on a series of workshops and bootcamps over the last six months, was invited to Amazon re:Invent 2015 to represent Intel at the day 1 and 2 bootcamps focusing on IoT and Intel Edison. 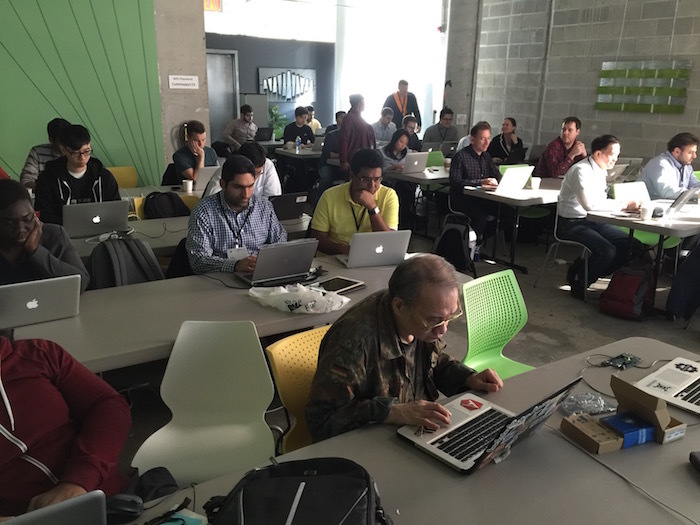 75 developers, bluetooth, WiFi, Amazon DynamoDB, Amazon Kinesis, Amazon SQS and Cognito.